A use case diagram provides a high-level description of what your system should be able to do and who or what will interact with it. Use Case Diagram for Hospital Management System. 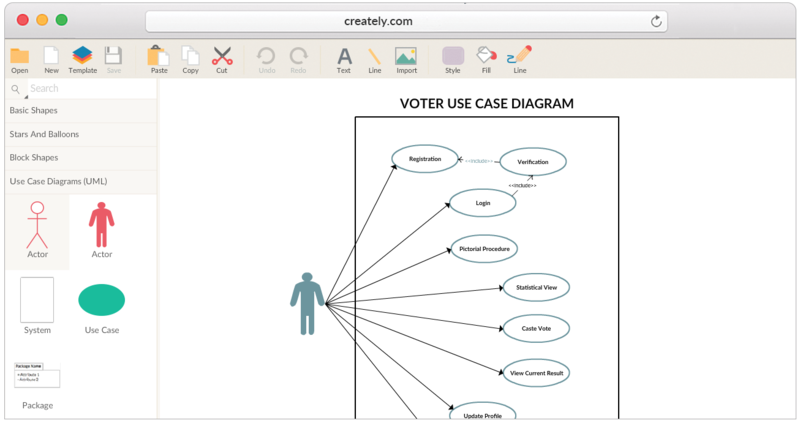 Design your systems with Creately Use Case Software. Editable templates and collaboration features for teams. Telephone catalog use case diagram example including possible use cases and actors. Editable use case diagram for tour agency or travel agency system. See the different actors and how they interact with a travel system using this diagram. Plantilla de diagrama de caso de uso de cajeros modificable. Edite este ejemplo con nuestra herramienta de casos de uso en línea y cree su propio caso de uso del sistema de cajeros para su sistema o proyecto. Puede editar esta plantilla y crear su propio diagrama. Los diagramas de Creately se pueden exportar y añadir a Word, PPT (powerpoint), Excel, Visio o cualquier otro documento. Para unas impresiones de gran calidad, use exportar en PDF y exportar en SVG para imágenes nítidas grandes o para integrar sus diagramas en cualquier lugar con el visor de Creately. Use Case Diagram Template of Restaurant Order System. Use Case Diagram Template of College Registration System. 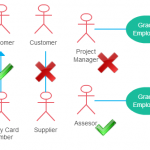 Use Case diagrams are used to identify the primary elements and processes that form the system. They are also great storyboard tools for user meetings. They define the requirements of the system being modeled and hence are used to write test scripts for the modeled system. Check out use case diagram tutorial for a detailed guide. 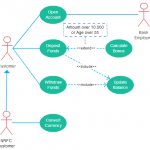 An online use case diagramming tool enhances the benefits you get from drawing a use case. If you edit it multiple times the final version will remain clean. You can easily share your diagram and verify the results. And you get access to it from anywhere in the world. The list goes on and on. Visit the UML Use Case Objects page to get an understanding of all the objects used for UML Use Case diagramming. All these objects are available as a library in Creately so it's just a matter of dragging and dropping objects when you want to create a use case diagram. If you're a newbie when it comes to all things UML, this really is the perfect starting point for you.